(SCOTTSDALE, Ariz.) The Arizona desert again hosted the biggest crowd of the year in American polo with just shy of 12,000 fans, on Saturday, October 25th and Sunday, October 26th where polo fans witnessed some of the fastest, most skillful and aggressive polo ever played in Arizona at the Bentley Scottsdale Polo Championships: Horses & Horsepower. Now in its fourth year, the event, which is dubbed The Polo Party hosted top players from around the world including the top female American player Sunny Hale and top male player Julio Arellano, as well as last year’s defending champions Clogau Wales Polo Team, England’s Sarah Wiseman, Paola Martinez of Argentina, Caroline Anier of France and top American collegiate player Patrick Uretz. And in between it all was a live art auction, dog fashion show, World’s ‘Longest’ Catwalk, and The Arizona Porsche Concours D’ Elegance. The action started Saturday as the hometown Scottsdale All-Stars Polo Team edged out the Gay Polo League by a score of 6-5. The Gay Polo League, which is based in Florida and the world’s only organized gay polo league, almost came back scoring 2 goals in the last 30 seconds. In the fierce match that followed on Saturday, defending champions Ricky Cooper, Richard Blake Thomas, Roddy Matthews and Pete Webb of the Bentley Scottsdale Clogau Wales Polo Team toppled the Molina Fine Jewelers Woman’s World All-Star Team at 9-5. Pete Webb of Wales, who earned MVP honors for the weekend, led the team scoring 8 of its 9 goals Saturday. Sunday more teams assembled for the USPA Governor’s Cup Match. Polo players from the around the U.S. visiting for the United States Polo Association’s Annual Meeting competed for the Governor’s Cup that ended in a victory for Team Heineken over the Sears Vacations Team. Sunday’s All-Star match proved to be the highlight of the day when 9-goaler and top U.S. polo player Julio Arellano, representing Barrett-Jackson faced-off against Saturday’s MVP, Pete Webb of Bentley Scottsdale. 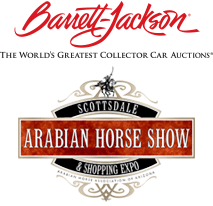 The 2014 version of the Bentley Scottsdale Polo Championships also produced a stellar line-up of horsepower featuring a preview of the Barrett-Jackson Collector Car Auction, Bentley displays and featured more than 200 impressive versions of automotive horsepower, including cars from Ferrari and Lamborghini clubs and the Porsche Concours D ’Elegance. The Scottsdale Arabian Horse Show dazzled crowds along with the First Canine Couture Fashion Show presented by Applewood Pet Resort and The World’s ‘Longest’ Catwalk Fashion Show sponsored by Cullum Homes and presented by Phoenix Fashion Week. When fans cheered for the polo stars, at times more applause could be heard during Saturday’s LIVE Larsen Art Auction held inside the Omni Scottsdale Resort and Spa at Montelucia Wine and Spa Lounge. More than 240 works of art were auctioned off to the highest bidders, totaling into seven figures of sales. “The results are in and the 2014 Larsen Art Auction was a huge success. With 700 registered bidders from 46 States and 33 countries the Larsen Art Auction sold 80% of the available lots and are actively accepting post auction offers on remaining lots. With a backdrop of the McDowell Mountains, fashion shows and polo matches, collectors commented that it was truly a unique art experience,” said Scott Larsen, of the Larsen Gallery. About the Polo Party With the breathtaking backdrop of McDowell Mountains in Scottsdale, Arizona the event started in 2011. Just four years later it has transformed into the country’s most attended polo event and without question, one of the world’s most interesting. It returns to Scottsdale in 2015 on October 24th.